This week I had the opportunity to attend the SAPinsider event, HR Innovations 2019. This event had a familiar look and feel to past SAPinsider HR events like HR2012 – HR2017, albeit on a much smaller scale. Held at the Bellagio in Las Vegas, this event was co-located with the annual events for Financials 2019, GRC 2019, Basis & SAP Administration 2019 and BI, Analytics & HANA 2019. There were approximately 2,000 attendees overall, with around 64 of those attending the HR conference (probably representing about 20 different companies). SAP’s Ralf Wagner gave a session titled “The Future of SAP HCM On Premise Solutions” where he shared roadmap updates. 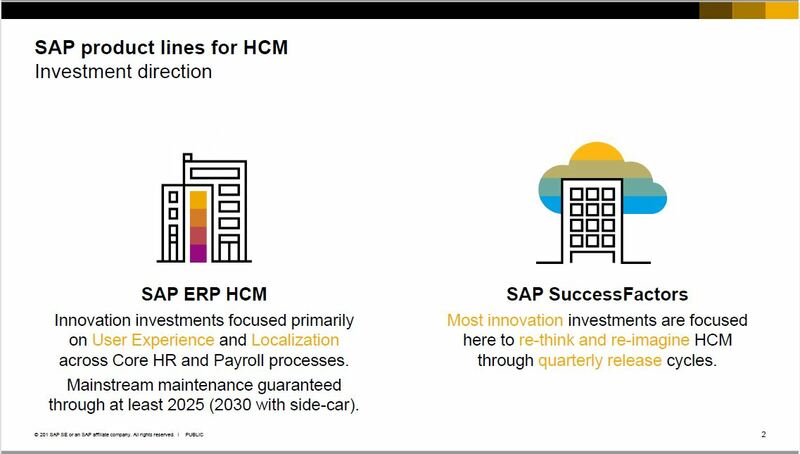 My impressions from that session include that SAP is investing in two key areas within their HCM portfolio: SAP ERP HCM and SAP SuccessFactors. In other words, innovation continues on both fronts. The focus of innovation through calendar year-end 2025 for on-premise has to do with user experience leveraging Fiori, and localization across core HR and payroll. SAP does not plan to launch any new technology or features as part of HR Renewal whose development is considered complete. There was talk about the 2025 guaranteed support date for on-premise SAP HCM and Payroll customers. As you may know, the date of guaranteed support has changed a couple of times, most recently from calendar year-end 2020 to calendar year-end 2025. Ralf spent a bit of time talking about the Sidecar option, launched in 2018 as a bridge for those customers needing more time to start their journey to SuccessFactors. What I found interesting was the inclusion of the phrase “at least” 2025 as shown in the picture above and the phrase “at least” 2030 as shown on the slide below. I think that may be the first time I saw that type of language in print, leading some to speculate that the date may continue to be extended. Later, Ralf shared the slide below, showing the 2030 date with an arrow extending beyond it with a ‘plus’ sign. This slide raised some debate during his presentation, not about any possible beyond 2030 extension, but rather the scheduled end-of-rights for the compatibility packs in 2025. A couple of attendees expressed frustration that the messaging around the use rights end of 2025 was a bit inconsistent with SAP’s earlier messaging about how quickly a customer should move to the cloud. 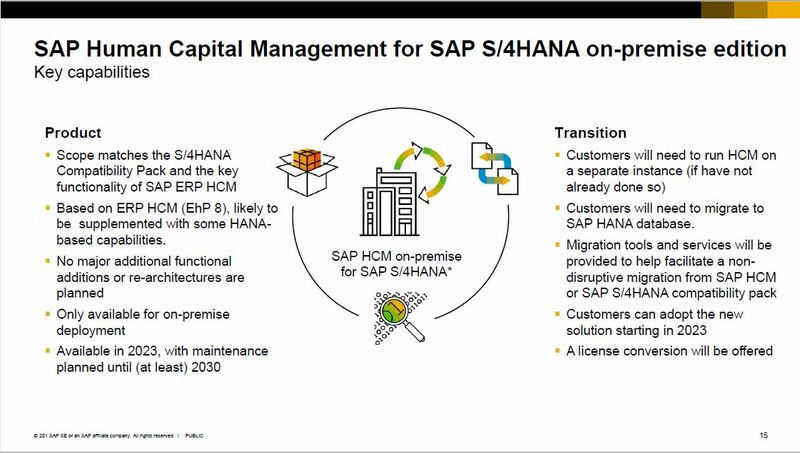 For example, you can use SAP HCM in S/4HANA until 2025 with Compatibility packs, however, you must use the Sidecar in a separate instance after 2025. 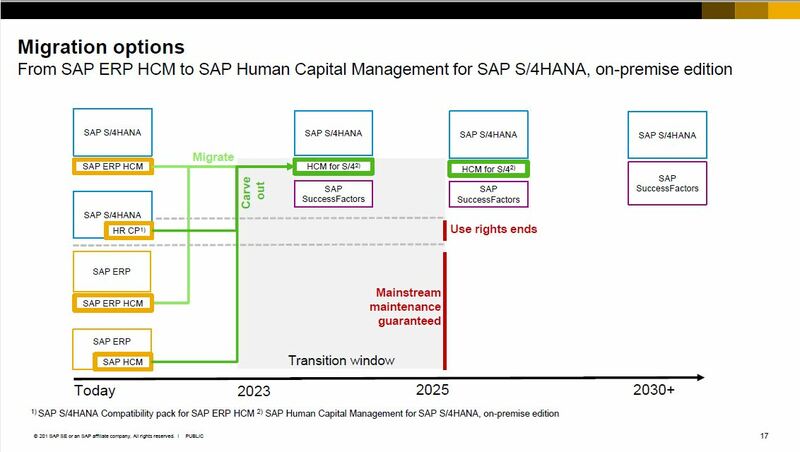 Will SAP HCM be merged back into S/4? In response to customer inquiries, Ralf stated that there is no plan for SAP HCM to be merged back into S/4. The summary for this session included encouragement for all of SAP’s approximately 15,000 ERP HCM customers to move to SuccessFactors to accelerate their digital HR transformation, while also acknowledging that there is a subset of existing on-premise customers who wish to continue to stay with their on-premise solutions for the foreseeable future. Good post, hope we continue receiving news about the side-car functionality in the near future. It was more than a year without any news. Great job on this Danielle! I can’t emphasize this enough: if development budgets are starting to tighten across SAP, EVERY dollar possible needs to be invested in the future (SuccessFactors). SAP HR should only get the money necessary to keep the lights on. I believe the whole sidecar discussion is just a distraction from the real focus that SAP has to have and that is making SuccessFactors so compelling that it’s simply malpractice to stay on premise. I don’t think we’re there now but we can be with the right investment. Hi Danielle, It was great being at the HR Innovations 2019 conference with you. Great job on this post – it nicely summarizes some of the key points regarding on premise HCM from the show. I have also posted my own reflections of the conference here.